Saturday can be a frenzy of kid’s games and shopping, of errands and housework, of literally playing catch-up. As women we often put everyone else’s needs before our own. May I suggest that today you do something to strengthen yourself? Maybe just a brisk walk, or a ‘slow quiet one’ if that would better suit your need. An hour with your Bible and favorite devotional. Meeting a friend for a cappuccino. Whatever will help you recharge your own battery will ultimately help all those who depend on you. “You deserve a break today”isn’t very spiritual, but “You may need a break today”. God never intends that we run ourselves ragged. We’re human and subject to wear and tear. Sometimes we have to make an opportunity for refreshment. 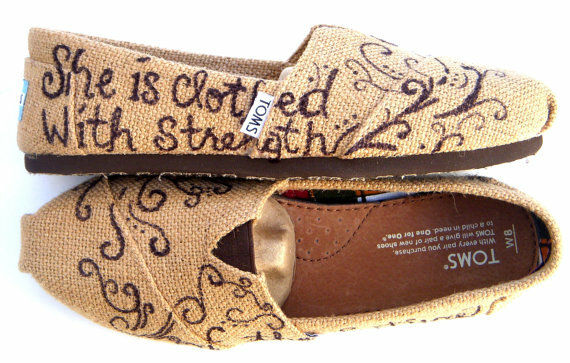 This post is dedicated to my friend Carolyn who found these custom painted TOMS and sent me the link. She’s a Proverbs 31 Woman. And all of us here in California miss her beautiful smile and sweet encouragement. ← How Will You Decide? Thank you for visiting my blog. How about you? What do you for refreshment and relaxation? How very kind Beryl. Thank you.